When late muzzle-loader season opened last Sunday, my dad, two of my younger brothers, and I spent opening day through this Friday (6 days) out in the field. Both my dad and my younger brother filled their tags (The other younger brother just tagged along), but mine has gone woefully unattached to any four-legged beastie. This was not for lack of opportunities. We have located an AWESOME hunting spot, crawling with mule-deer. I had at least 3 very good chances to bring home some venison, but when the time came to pull the trigger, I hesitated. I would try to screw up my courage, but by the time I was ready to shoot it would be too late. Either the deer would leave at a run, trot out of range (150 yards with a muzzleloader), stand against the skyline, or otherwise make it impossible to shoot. Once we had just breached a hill, and were cautiously moving forward, when my Dad announced that there were some deer up ahead. 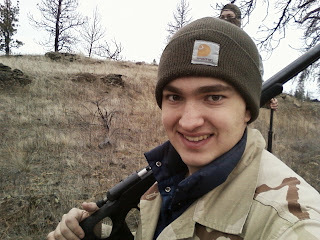 A quick glance revealed that we had spooked a herd of mule-deer does (the only deer we could shoot). We stood like statues for a minute or two while frantically developing a battle-plan. The end conclusion was that my dad, who had already gotten his deer, and my youngest brother, who was too young to hunt, would stay in plain sight of the deer to distract them while I and my other brother snuck around to the side and got within shooting range. We quietly snuck along a cliff edge. When I figured we were close enough, we popped our heads over a rock outcropping to spot the deer 75 yards away. I set up for a shot, lining up a deer in my sights. It was standing broadside and didn't seem to be too concerned. It was as close to a perfect shot as possible. But I hesitated, and lost that chance. I regret not pulling the trigger. I sorely regret that choice (yes, it was a choice). Regret is not a bad thing, regardless of what the modern psychologists say. It, like doubt, is neutral. What we do with it is what makes it good or bad. It should not cause us to keep from trying again, but rather should prompt us to make the right choice later on when that question once again is presented to us. We shouldn't live in the past, but we can't ignore the past either. We need to be able to look back and learn, which involves regretting what we did wrong, while deciding the proper way to do it in the future. I didn't learn that fast enough, which mean that I passed up several easy shots in the course of the week. I finally did realize that though, but lo and behold, the next day (and probably the last day this year) we found no does (it's a doe-only season). We have never had a single day where we saw no does in two years of hunting in the same spot. It was a little perturbing. As Christians, we tend to pass up many opportunities to be the salt and light of the world because we hesitate. We think "I'm not an expert, I don't have my bible with me, I can't speak clearly, what if I mess up, I'm not perfect, aren't there other people who are more prepared than I?". What's often worse is that I don't think we regret these missed opportunities nearly as much as we should. I would like to end with a challenge; look back at the past week, and think of all the chances you had to share Christ with the world. Think about them, and regret the missed opportunities. Don't stop at the regret though, utilize it! Get a pocket Bible, and bring it along. Spend more time in The Word. But more than anything, make the most of the opportunities that God has given you. You may not have those chances again, and souls are not something trivial.